The sun provides an unlimited resource for power around the world. And more and more people are tapping into that energy for their homes and businesses. Solar power is becoming a positive energy source for many people who are looking to reduce their carbon footprint. Despite solar power’s great potential, few people are actually using it. In 2008, only 0.02 percent of the world’s totalenergy supply came from solar power. This number, however, is expected to increase as solar power becomes more readily available and affordable for more people. The installations of solar power cells increased by 83% in 2009, with the biggest boost coming from Germany, which is now the world’s largest consumer of photovoltaic electricity. Solar power first came into being in 1958 with its use on the Vanguard I satellite. Using solar power cells as a back-up power source, the Vanguard was ale to continue transmitting for over a year after its chemical battery ran out of power. Because of this achievement, many American and Soviet satellites began using solar power cells as well. However, due to the high prices of creating these cells, solar power was not widely available until the early 1970s. By thenm, however, solar power had become an established source of power for many telecommunications satellites around the world. Due to the 1973 oil crisis, a rapid rise in solar power production was marked throughout the 1970s and 1980s. This higher demand, along with a decrease in production costs, brought down the costs of solar power cells for home and commercial use. Between 1984 through 1996, growth of solar power cells stayed at a moderate 15 percent per year. 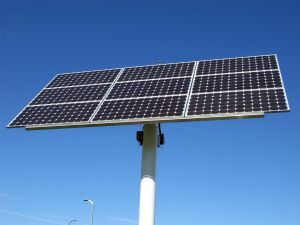 There are several different types of solar power cells, however four are the most commonly used. This includes crystalline silicone, ordinary silicon cells, thin film cells, and concentrator cells. Each has their own unique benefits and drawbacks that make them perfect for different situations. Crystalline silicone cells are the cells most commonly used in solar power plants. These cells are made from two layers, a positive layer and negative layer just like in most semiconductors. An electric field is created between the two layers when photons from the sun’s light strikes the semiconductors and released electrons. Some of these cells are made from polycrystalline silicon, which are smaller silicon cells put together in large bunches. With these cells efficiency is compromised, though they are much more cost effective to make. Ordinary silicone cells are smaller in size than crystalline cells, and produce less energy. Single silicone cells are often used in watches and calculators because of their size and limited potential. However, large modules of silicone cells can be placed together to create larger amounts of energy. With enough cells, one can power their home. Thin film cells are durable, light-weight solar cells that are easy to assemble. These are some of the most efficient solar panels, with an ability to convert 90 percent of the usable solar energy to electricity when exposed to light. Thin film cells also require less semiconductor materials, making them incredible thin and light-weight. However, despite their durable nature, thin film cells do not easily stand up to nature making them not an ideal choice for homes. Concentrators work like optical lens. Light is concentrated to become increased and used with other solar power types. Concentrators are made from crystalline silicon materials, and can produce more energy than other types of cells. However, they are most commonly used in expensive and high tech industries like space and satellites. Solar power works in an interesting way. It begins with sunlight, a naturally available and powerful resource that we tap into. Sunlight is one of the best sources of power because the sun creates more each day than we can use. It is readily available around the globe and does not deminish from pollution or use. Solar power cells, also known as photovoltaic cells, convert this energy into electricity for our use. Solar panels work similarly to large semiconductors. When the polar panels are exposed to sunlight, the junction diodes convert the energy into usable electricity. Photons from the sun’s light strike the solar cells, releasing electrons. Then, the electric fields in the solar cells pull these electrons in a directional current. From here, metal contacts in the solar cells turn the flowing electrons into electricity. The more solar cells, and the higher queality of the cells, the more electricity can be produced. Outside factors can affect how well the solar panels work. Shade, cloud cover, and other obstructions and decrease the amount of energy put out by the solar cells. Angle and degree can also affect how much energy the cells are able to use and convert into electricity. This is why many solar panels have dynamic mounts, which allow the panels to move and follow the sun across the sky. 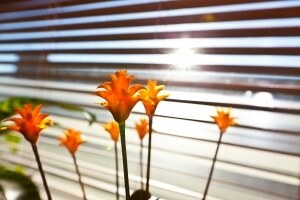 Doing this allows the cells to get the maximum exposure to sunlight at each moment of the day. Solar power is a growing trend in many parts of the world, as the prices to create and install solar cells continues to decrease. More and more homes and businesses are utilizing solar power for their energy needs. Using solar power decreases the amount of carbon used for traditional power sources, and can lower energy costs. 1-800-Flowers.com, an online florist and gift shop, has expanded its collection of Happy Hour Bouquets to include six new original and fresh floral arrangements. Inspired by classic cocktails, including margaritas, sangrias and martinis, these new hand-crafted floral bouquets in 9″ reusable and food safe acrylic martini and margarita shaped vases are the perfect way to stir up excitement, whether it’s to toast a special occasion, say “thank you,” or even serve as home decor for a summer soiree. – Margarita Bouquet: Mixed with yellow roses, green carnations, green spider mums, poms and hypericum, this fresh floral arrangement is accented with realistic green lime slices and green straws. It is an unforgettable gift that will keep the party going. – Apple Martini Bouquet: Make friends green with envy with this truly original floral arrangement. Inspired by the popular Appletini, this arrangement is made up of the freshest green carnations and poms with alstroemeria and fresh greenery. This recipe is accented with straws and green apple picks, sure to shake up any occasion. – Sangria Bouquet: Spice things up with our fresh floral version of the popular wine punch. Complete with roses, carnations, alstroemeria, poms and statice, this chic bouquet also includes slices of realistic fruit picks for a truly one-of-a-kind arrangement. – Lemon Martini Bouquet: Send sunny sophistication with the truly original Happy Hour Bouquet, inspired by the famous Lemon Drop Martini. This floral arrangement is mixed with cheerful yellow roses, daisies, alstroemeria and solidago. – Blue Hawaiian Floral Margarita: The freshest roses, Dendrobium orchids, alstroemeria, daisy poms and solidago are topped with a faux pineapple pick, straws and a paper umbrella to make any celebration an exotic affair. – Strawberry Floral Margarita: Fresh, fun, and fabulous all over, this stylishly sweet arrangement of roses, asters, carnations and dianthus gets the party started with a touch of pink perfection.